Diesel is not good for the health just as burning any sort of fossil fuel like coal, wood, peat and petrol is not good for the health and often the combustion process involved has climate change impacts. The health impacts are numerous and the World Health Organization (WHO) has recently classified air pollution in general and diesel (but not petrol) as a Group 1 carcinogen, that is like cigarette smoke. A variety of toxic chemicals are emitted from vehicle exhausts when being driven. The most important for the purposes of this blog are the Nitrogen Oxides (often termed NOx which consists of two main molecules, NO or nitric oxide and NO2 or nitrogen dioxide). The other important pollutant is more difficult to define chemically because it can be part soot, part acid, part heavy metal and part polyaromatic hydrocarbon (PAH). We call it Particulate Matter (PM) and can be inhaled into the lungs causing damage especially to the at-risk population, in other words the old, the young and those with underlying respiratory problems like asthmatics. Most of the risk is associated with long-term exposure but it is certainly not pleasant to get a gulp of truck or bus or car exhaust when walking the dog. The levels of pollution have become so great in some major cities in Europe like Paris and London that their mayors have considered banning vehicles in their cities, with a recent emphasis on diesels. So from July 2015, Paris will ban the use of diesel engines manufactured before 2001. (Unfortunately not before the great wave of smog engulfed parts of France and UK around St. Patrick’s Day because of high pollution levels in Paris and weather conditions in England). In any case London will likely increase the congestion tax on diesels over the coming years for the current fleet on the roads. In fact diesel vehicle manufacturers have cleaned up their acts over the past 10-15 years and now include particulate filters, catalysts and so-called Diesel Exhaust Fuels (e.g AdBlue) in order to reduce the emission problems. But very often, and particularly regards nitrogen dioxide, the emission levels recorded in the engine testing laboratories are quite different from those measured on the road! So we should look forward to the day in September 2015 when the new Euro-6 engine standard becomes enforced. This promises much reduction in the toxics but we must remain vigilant on monitoring the air close to roads. We must also set more stringent NCT’s that really measure directly the levels of the small, harmful PM emitted from cars. Given the above toxicity message and the fact that two big European capitals are taking measures against diesel vehicles why, in Ireland, are diesel fuel and diesel engines subsidized by the Government? When you get a fill up at a station diesel may be 5-10 cent cheaper per litre than petrol! The vehicle tax on diesels is less than petrol equivalents. And also some businesses can get a rebate on the diesel (mineral oil) tax they spend out on. Again, why? Well it is mainly associated with the fact that diesel engines emit less of the Greenhouse Gas called carbon dioxide because the engines are more efficient with the fuel. (Weight for weight though, petrol and diesel release about the same amount of carbon dioxide). So the subsidy is based entirely on climate change issues rather than direct health problems. Somewhat ignored here in this global warming context is that the particles emitted by diesel, when they float up in the atmosphere, act as heat insulators and therefore have a similar effect to carbon dioxide. The road transport lobby will obviously object to my suggestions about raising the taxes on diesel. They will say it will raise costs, increase prices etc etc. But what about the financial savings on the health services? And the emotional savings that families will receive if their family members do not become ill with air pollution related disease? Provide education to the public about the dangers we face from air pollution and climate change. Give medical services, hospitals and bodies like the asthma society more money to combat respiratory disease and related problems like COPD. 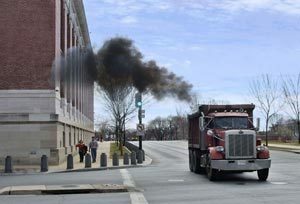 Get EPA to support more “brown skies” research on air pollution and health. What for the future? Electrification will obviously play a part with power from solar panels and/or new generation batteries. But realistically we appear unable to wean ourselves from fossil fuels….and so we can only hope that in about 15 years’ time when the whole diesel fleet is run on Euro-6 and Euro-7 engines that walking along the pavement no longer requires holding your breathe when a great big truck or bus or SUV passes by.